Two occupied territories seized by Russia from the defeated powers at the close of WW2 are at the centre of new tensions. Bastion and Bal Anti-Ship Missile (ASM) systems have been deployed to the Kurile Islands off the northern tip of Japan. Meanwhile, on the other side of the world, the Kaliningrad enclave – already stuffed full of military hardware and host to the major naval base and warship construction yard at Baltiysk – has in recent weeks also received Bastion batteries. The land-based missiles move was preceded by a decision to switch cruise missile-armed Russian Navy warships from the Black Sea Fleet (BSF) to the Baltic. In late October the Serpukhov and Zelenyy Dol reached Baltiysk. Both Buyan M Class corvettes, they are armed with Kalibr-NK land-attack missiles, a type of weapon used by Russian vessels to attack targets in Syria on more than one occasion. Kalibr also has an anti-shipping capability. In the Pacific, Russia and Japan are still technically at war over the Kuriles – Japan’s one-time Northern Territories. The Soviet Union’s occupation of them in 1945 led to a peace treaty not being signed between Russia and Japan. Until the new missile systems were placed on the Kuriles there were high hopes of a trade deal and the signing of a formal peace agreement when President Vladimir Putin visited Japan. The Bastion can launch supersonic Onyx missiles, providing the ability to hit vessels around 370 miles offshore, while the Bal system has the formidable, X-35 missile (range 74 miles). The southernmost Kuriles are less than 20 miles from mainland Japan and the Russian missiles are thought to also have a land-attack capability. The defence ministry in Moscow said that it had good reasons for activating the ASM batteries in the Kuriles, but did not say exactly what had changed in local circumstances. The Russians have also sent short-range Iskander ballistic missiles capable of being armed with nuclear warheads to Kaliningrad. In the recent past Russia has threatened to nuke the warships of NATO nations that dare to join an Anti-Ballistic Missile (ABM) network. NATO is in the process of standing up a land-based BMD system based on the US Navy’s AEGIS combat system and Standard missiles, with detection and launch sites in Romania and Poland. 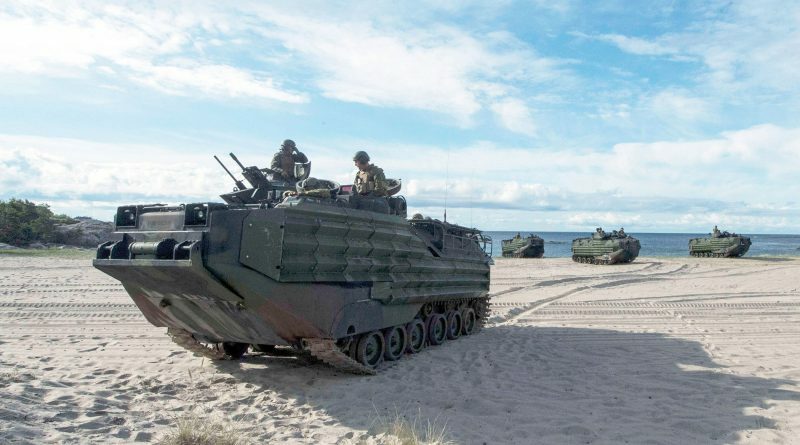 US Marines come ashore on the shores of the Baltic during the BALTOPS 2016 exercise. Photo: US Navy. Moscow claims that its Kaliningrad missile deployments are in response to these BMD sites, which it refuses to believe are not aimed at neutering its nuclear deterrent forces. It also objects to the increased level of NATO exercises in the Baltic and Eastern Europe. Russia especially resents the occasional deployment of BMD-capable US Navy destroyers in both the Baltic and the Black Sea. Russian sources suggest that because NATO’s new land-based BMD sites rely on silos the same as those fitted to USN warships, they can easily be switched to fire Tomahawk cruise missiles for use against Russian cities and military bases. From Moscow’s point of view Kaliningrad is particularly vulnerable to encirclement and attack. Invaded and occupied in 1945 by the Soviets, it is the former capital of East Prussia (then known as Konigsberg). Under international agreement it was absorbed into the Soviet Union, with the German population expelled and Russians imported. With the end of the Cold War and break-up of the USSR, Kaliningrad found itself cut off from the rest of Russian territory, with Lithuania on one side and Poland on the other. Both those former vassal states of the USSR have become members of NATO and the European Union since the end of the Cold War. Baltiysk is the main operational base of the Baltic Fleet and is home to its most modern ships and submarines. The other Russian Navy bases in the Baltic, at Kronstadt and St. Petersburg, are not ice-free all year round. Russia has also sited Bastion and Bal batteries on the shores of the recently annexed Crimea, which aim to deny freedom of manoeuvre at sea to NATO warships in the Black Sea. Around the world it appears Russia is securing its flanks with missile batteries that have a long reach out to sea and even, in some cases, deep inland.